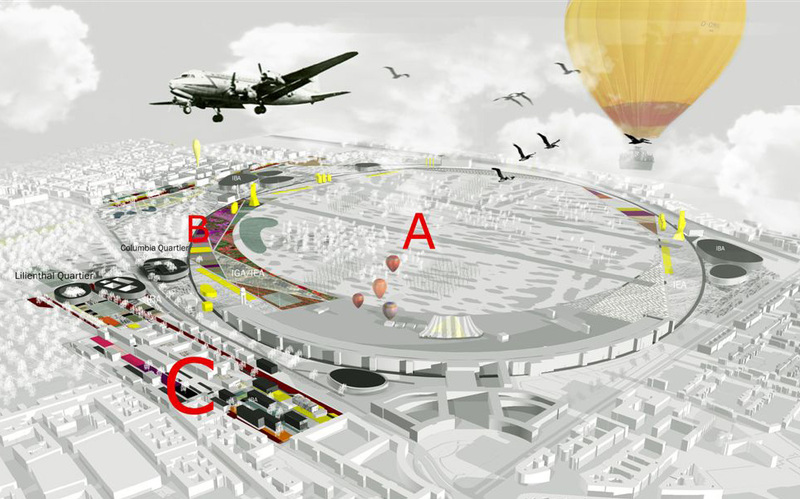 In May, the Berlin Senate announced three equal prizes for the international urban ideas competition for the Columbia Quartier and the former airfield Tempelhof, Berlin. Chora Architecture & Urbanism, in partnership with Buro Happold, Gross Max and Joost Grootens was one of the three winners. Plan for the renewal of the Tempelhof Airport site, Chora Architecture & Urbanism, in partnership with Buro Happold, Gross Max and Joost Grootens. The historic site of the former Tempelhof Airport can demonstrate the future of our cities. A future of low energy structures, green energy producing systems and smart networks. Supporting a high quality of life for local residents and creating a symbol of hope and renewal for the city. At the core of our proposal is a participatory instrument enabling inhabitants and other stakeholders to creatively negotiate a processed-based development. The process is illustrated with three dynamic phases including practical design steps that create access to the whole site, the development of several new city quarters within the context of an international building exhibition (IBA) and new types of experimental landscape where technologies and nature merge. The result is radical: an economic, social, cultural and political context to turn the whole area into an alternative powerplant. Tempelhof becomes a communal space which connects people, supplies renewable energy for the adjacent districts and implements the goal of the German government to lower Co2 emissions, in short an Energy Incubator. The winning proposals, will form the basis of the masterplan being created this year by the new development agency of Tempelhof.